*Disclosure: This is a sponsored post written by me on behalf of Source4Women. All thoughts and opinions, as always, are my own. Source4Women is a community created by UnitedHealthCare and provides healthy living tips on topics such as nutrition, exercise, health screenings and more. One of my favorite things they do is each month is a We Dare You To Share image upload contest where they dare you to do something and you can upload your image for a chance to win really awesome prizes. Last month the dare was to post a picture of yourself spending time with your family. The picture I submitted to this month’s photo gallery. Vote for me! This month’s dare is a fun one because the dare is to protect your eyes and post a photo of yourself wearing sunglasses. I don’t know if you know this about me, but I love sunglasses. I have several pairs in my rotation that I wear regularly. So this challenge was easy for me – all I had to do was snap a selfie! I submitted the photo above of me and Kona on one of our morning walks. As you can see from the image, the sun was really bright. Glad I wore shades! Smiles & Shades – A little girl rocking her pink shades. Costa Rica Coconut- I want to drink fresh coconut water like this. Fun in Yosemite– A guy and his snowman. Peace – Love this girl’s shades. The Devil in Disguise– This guy’s costume is pretty awesome. And now, for the fun part- the giveaway! Go to the We Dare You… community and post of photo of you wearing your shades. Then come back here to Fit & Awesome to enter for a chance to win a $50 Gift Card to Sunglass Hut! 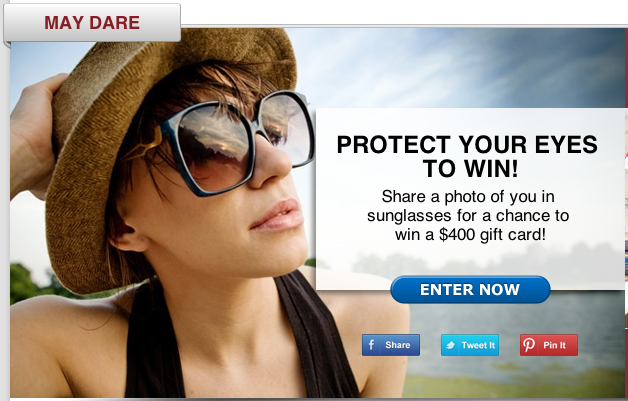 You can take your prize and get a sweet pair of shades for yourself or put it towards a pair. Good luck, and may the odds be ever in your favor! What about you? Do you always wear sunglasses when you go outside? What kind of shades are you rocking these days? Post in the comments and let me know! I must own a dozen pairs. I also love sunglasses. I’d wear them inside if people wouldn’t make fun of me. My favorites are these oversized, very Hollywood, black sunglasses I wear the most. My eyes are very sensitive in the sun, so I really like larger glasses. I love sunglasses that fit well! My husband loves the polarized sunglasses. My eyes are sensitive to the sun so I would love to try polarized sunglasses too. I like the shield-style sunglasses best. I like sunglasses that I can run and cycle in!